Elizabeth Forst is a Doctor of Physical Therapy educated and trained at Regis University in Denver, Colorado. Working as an orthopedic travel physical therapist, she obtained licenses in New York, Hawaii, Louisiana and California. Elizabeth focused her work primarily in California practicing at San Francisco General Hospital, University of California San Francisco and Los Angeles County Hospital\USC within the public health sector in impoverished communities; many of which had zero access to health insurance. With this experience, she is well versed in the difficulties and limitations of current health care issues. Her educational interests are based in behavioral neuroscience, orthopedic manual – based therapies and spinal cord research. 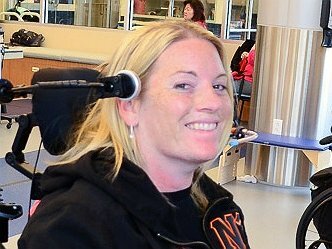 Paralyzed in a pool diving accident in August 2014, Elizabeth is rehabilitating at Craig Hospital in Denver and connected within the Denver Metro outpatient spinal cord community. Prior to her spinal cord injury, she was an avid international traveler with recent interests in Southeast Asia augmenting her physical therapy license learning Eastern – based healing techniques. During the summer of 2014, she obtained her 200-hour yoga and craniosacral foundation licenses in Bali, Indonesia. Elizabeth has competed in six triathlons through Team in Training and the Leukemia and Lymphoma Society, maintains an advanced scuba diving certification, and is a lover of all professional sports. She is connected within the international yoga community and is continually fascinated with the integration of Western and Eastern philosophies of healing. I just returned from my second diving trip with disability – with Craig hospital’s therapeutic recreation department and the assistance of A 1 scuba in Littleton Colorado. I performed nine dives in five days in Cayman Brock, a small island off the coast of the Grand Cayman’s in the Caribbean. The weather was perfect, the diving was impeccable, the support of my dive buddies and crew were awesome and a journey across the country/world was totally worth it. It took 25 hours to get home to Denver Colorado and I had to do 15 physical transfers and I cannot help to think that none of this would be possible without my family Tracy and Stephanie, my caregiver Debbie and my helpful lifters on the plane – you know who you are! Here are a couple Fun videos thus far of the trip… Enjoy and thank you again for all of your support, none of this would be possible without my friends, my family, friends of friends, friends of my family, etc. thank you thank you thank you! EB Forst Colorado fundraiser – EB’s Magical Mountain Gala – scheduled for June 10, 2017 at Lakewood country club in Denver Colorado! Stay tuned for details upcoming and how to buy tickets! For those that are following me for the Cozumel dive trip, I leave this Saturday! I was successful in fundraising the trip and thank you to all of those in such support of my journeys. Please watch the link below about my preparation in the pool, as you will see my excitement preparation! Anything is possible! 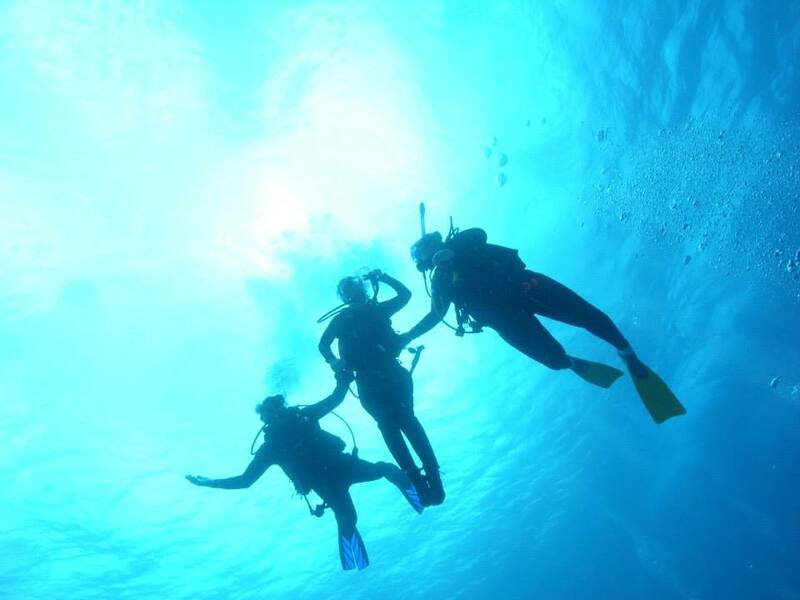 2 Weeks prior to EB’s accident she received her Advanced Diver certification in Thailand. the A-1 Scuba Guided Disabled and Able Bodied Diver Trip June 11 – 18, 2016 in Cozumel, Mexico. Help EB to attend and Overcome her Limitations! to learn more and make your donation. Thanks again to everyones love and support for EB!! Still planning on joining us tonight at the Fundraising Dinner? FOR LATE REGISTRATION please click the Register Button below. If you tried to register today using the following link: bit.ly/1ImMVJB, and received this message: “Sorry, this event is closed. You may still make a donation to the campaign.” please know that you can still register today by clicking the Register Button below. If you need more information, please contact Amanda Forst at 970-590-3849. In between crazy hail, thunder and lightning storms that are very representative of the springtime in the Rockies, it is time to update on my progress as many exciting things are happening here in Denver and in San Francisco the next couple of weeks. In-store for this blog is information pertaining to the fundraiser activities in Los Angeles and upcoming in San Francisco, a new exciting opportunity I have undertaken with the Christopher Reeve foundation, recent news on my spinal cord injury condition/therapy and some exciting tidbits about The Forst Family. First and foremost, this last week presented itself as very bittersweet as my mom returned to Charleston, South Carolina to settle into her new house to finalize her unpacking job that has been on hold for the last year as she has been my main companion, loving caretaker, and mother extraordinaire. I will miss her greatly yet I know it will be a fantastic time for her to get some well-deserved R&R, reacquaint herself with her new community and enjoy the wonderful, sunny and beachy summer in the beautiful South. She will also get to spend quality time with my brother Chris, his wife Carolyn and their new baby Madalyn Elizabeth who was born three months ago. Our family is so excited about their news – Carolyn, Chris and baby are doing beautifully. In my mom’s absence this summer, I am delighted to have my niece Rachel stay with me as she takes a summer break from her nursing program at Chaminade University in Honolulu Hawaii. She is already proving to be a great companion and roommate for me, and I look forward to spending a couple months of quality time with her and teaching her everything I know. Some exciting news on the job front is that I have been offered a position on the very first Public Impact Panel within the Christopher Reeve Foundation – along with eight other very impressive individuals of various ages and socioeconomic backgrounds dealing with paralysis. Our focus is threefold: research, advocacy and quality of life for those individuals in similar situations. I represent the newest injured individual of the panel, the highest level of injury and with a background in healthcare, yoga and meditation. We will have our first in-person meeting in early August as the foundation is flying us to New Jersey to the foundation headquarters to discuss our future work together to coordinate efforts. The position is unpaid at this time, yet is a wonderful way to get my foot in the door with a great organization and hopefully potentially grow into something larger in the future. Little did I know that when I was at Craig Hospital staying in the room that Christopher Reeve actually stayed in that I would I be following in his footsteps to be part of the revolution to find a cure and treatment for spinal cord injuries. It was meant to be smile emoticon. I am ready to start my public speaking career, lobbying DC, continuing to teach and educate and be part of this grand plan that I somehow found myself in a year ago this summer. Now onto the fund-raising updates. This past weekend, my very dear friend Joey Soto single-handedly organized an unbelievably successful fundraiser called Forst Fest Sun and Splash 2015; part fundraiser for my healing efforts and also a celebration of her 40th year. 2 full days…going into the nights at an ultra plush mansion on a private estate once inhabited by Frank Sinatra. Alongside awesome DJ beats, poolside fun, gorgeous vistas, live art, fire performances, friends from all walks of life and most importantly creating community –minded support – the event was a huge success with over 200 people attending. Thank you to all who made the trip to celebrate both of our lives; the outpouring of gifts, auction items, volunteer time and excitement to support for such a cause was overwhelmingly amazing. All I can say is wow! There is already talk about this being an annual event so stay tuned for 2016! This is what it’s all about people… Community community community. Very exciting news – The highly anticipated Norcal fundraiser is planned for June 25 in San Francisco at Tres, formally Tres Agaves, in the south of market area from 6 to 11 PM. The event will be yet another opportunity to gather friends and family in support of my healing efforts Including live music, dinner, drinks, live and silent auction items with great prizes, DJs and more! You would not believe some of the auction items coming in – including weekend trips to Vail Colorado, Orlando, Tahoe California… Private movie showings, catered dinners, DJ events, dog walking services, sports tickets for the Giants, warriors and San Jose earthquakes, bluegrass tickets, super expensive wine, gift certificates to high-end restaurants in the bay area, burning Man tickets, donated art from all walks of life, and on and on and on. The most exciting part of this event for me is that I will be in attendance – as this will prove my very first attempt at travel and what a better place to go but the city by the Bay. I hope to see all of you there, and please spread the word to all of your family members, friends, and to whomever would like to join us in the celebration. It is going to be a super fun event, especially since my brother Jon, his wife Amanda and his whole trademark events crew are helping plan the affair – thank you TM events, you have always been a major part of my cheering squad and I look forward to this amazing event. It will also represent myself fulfilling a lifelong dream of traveling and circling the globe… I started this journey one year ago in May with my trip to Bali, then to Thailand, back to the East Coast where I was injured then on to Denver for rehab and finally fulfilling this journey one year later back to San Francisco. Little did I know how I was going to make this around the world trip with the bumps in the road along the way, but excitedly I will be fulfilling this. Please see event information below – I attached a few different ways of how to attend. It is important to RSVP so that we know how many will be in attendance and can plan accordingly with the venue – we are expecting over 100 people! All levels of support are most appreciated! EB, thinking of you at this spiritual and magical time of year and wishing you every good thing imaginable! Merry Christmas, much love. Sunshine Soul Sister, I am so proud of you and I love you for eternity! Hi Elizabeth -- The news on your pages is good. The Reeves Foundation must be delighted to have you with all your skills and savvy. I'm sending you a ton of best wishes. EB, It's amazing how easy we got caught up in our day to day. I feel terrible as I just found out about your injury through Facebook and I wish I had been able to offer some support sooner! All of those years supporting TNT its only fitting that you deserve every little bit that can be given. You were always so positive and fun to be around. You were/ are such a generous person and you deserve it back now more than ever. I'll will keep you in my thoughts and send good juju your way as you get through your recovery and rehab. Be strong... as every bit that you get better, even if it's the smallest movement, gives everyone around you and in your circle TONS of courage and strength to tackle their/our everyday "challenges" as they pale in comparison to the obstacles that you are overcoming on a regular basis. Every achievement matters, seriously, no matter how big or minute it may seem. Sorry we were not able to make the event….I'm sure it was wonderful! All the best to you Elizabeth. I hope we can all meet sometime on the "Hill". EB, I am sorry to miss the fundraiser in SF. Jon and Elle are friends of mine and that makes you family too. My catering company, Beets, has done lots of work with Trademark in the past. You are lucky to be surrounded by such a team of awesome loyal friends. I look forward to updates on your new work. Hi Elizabeth, my husband Duncan and I send lots of love and support your way. We've been lucky to know Jon and Amanda and have heard wonderful things about you. We look forward to hearing more. Hello Elizabeth, We've never met. Amanda shared your moving story with me (we used to work together). Your resilience is inspiring, and your vulnerability touches me deeply. Many flowers blossom in the nooks and crannies of seemingly barren landscapes. I wish for you to find each and every one of them. Hi EB - We've only met a few times, but Julie has shared with me about your accident and your rehab process. I have so much admiration for your bravery and perseverance and I know you will continue to make a difference in people's lives. You are in my thoughts often. Dear EB, You are in our thoughts and prayers, always! Let God's grace lift you up, your spirit of adventure carry you forward, and the love of your friends and family give you the strength to continue! Hi Elizabeth! I haven't seen you since you were little (an adorable petite blondie with freckles) and you probably don't remember me. Your sister Allison was one of my best friends at Chaminade. My family and friends in the mothers' rosary group at St. Clement Church in Chicago are praying passionately for your full recovery. I believe in miracles and the incredible power of prayer! May our heavenly Father bless you and watch over you. We are with you, Elizabeth, and hope for the very best. Much love and many prayers Ebas! Stay strong!! Tom Stroot and the Damascus Stroots. EB- The Lowe Family and all of K-Town think of you daily. Keep up the hard work. See you at Caddies in a few weeks. I read your story placed in a Xmas card from our employer Preferred Healthcare. Your story touched my heart. My prayers are with you and your family. And I send you light and love during your rehabilitation to recovery. We love you, EB. You have amazing strength and determination. Keep it up...EBSTRONG!!! Lots of love to you my sister!!! Thinking of you everyday and can't wait to see you in a couple of weeks. EB, thinking of you every day. Cant wait to see you when we come to visit in a few weeks. Keep working hard and pressing forward. Seeing you and reading your updates are so inspiring! You are an amazingly strong woman EB and we are all so lucky to know you!! Sending you huge hugs and love from SF!!! GO GIANTS!!! xoxox ebs.... couldn't believe it when i heard. :'( you're such a strong woman, it's amazing to see you smile here in this photo despite what's happened. you're an inspiration. I wish you all the best!! I know you're getting great care at Craig, but I'm sending you love and light as well. hey eb! every time i see you, you look stronger and stronger. proud of all of your hard work! keep it up. lots of love.